This is the first part of a series of concrete examples and very brief summaries of organizations that have some component of direct action and a form of collective bargaining that operate outside the labour relations framework. The first series are entirely owner operator associations in Transportation. There is a conventional argument, bolstered by employers, that these folks are not workers but rather small business people. Of course that’s nonsense, being a worker is not determined by the form of wage you take and being paid piece rate is as old as payment itself. Owning your own tools does not make someone a business owner, if that were the case many tradesmen wouldn’t be workers. These workers have responded to a unique situation that opens up positive examples for organisers all over and should be watched. a.) Yellow Cab in Edmonton. Taxi drivers in Edmonton had an association for a number of years that would make demands on the City of Edmonton, various hotels and their own company. They would back up these demands with direct action. Their main tactic was car pickets. In some disputes they would circle around a hotel where there was a grievance, or city hall, on at least one instance they blocked the onramp to the airport. Advantages: They had a very high level of member engagement and a capacity to take action that could make some pretty big wins and take on large institutions. Disadvantages: They didn’t seem to have a method for clearing out small grievances, little issues that didn’t require hundreds of cars in an auto picket. What happened? They eventually were certified under the Teamsters who made some big promises. The Teamsters failed to get a first contract and went on strike. The strike collapsed because a number of cabbies scabbed and didn’t honour the strike. This is in stark contrast to the auto pickets that had a high level of participation and almost no scabbing. Many workers were afraid of losing pay or felt they couldn’t afford this. Some of this is probably bad/sloppy organising on the part of the Teamsters but the advantage of the old association was they could also take job action while at work without being threatened with ALRB fines, unlike the Teamsters. This let them collect fares and take action in the same day. 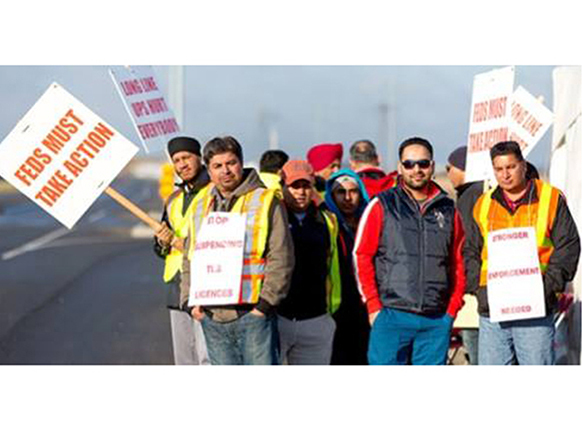 There is still a Taxi association in Fort MacMurray that operates on a similar basis and protests that look similar from a distance in Calgary. b). Alberta Sand and Gravel Haulers. These drivers came from similar groups of new canadians as the Yellow Cab workers and had a similar organisation. They seem to rely on some legal avenues, used more media publicity and there is some evidence they do some lobbying. Near as I can tell they are still around but several years ago they had a series of job actions where they drove around in circles at the Alberta Legislature with their covers off, spraying dust and small particles of gravel everywhere. They were pretty effective at getting concessions and managed to actually engage in some concrete negotiations. Advantages: Managed to be stable and long term. Disadvantages: Pretty similar to Yellow Cab, there seemed to be no visible way of settling smaller disputes. What happened? Still operating, militancy subsided with some concessions granted. Often actions are tied to gas prices so it creates a situation where there is a sort of ongoing collective bargaining around rates. c). Reynolds Diaz Contractors. On three separate occasions the contractors at Canada Post who worked under a subcontractor called Reynolds shut down the mail. Once in 2010 in retaliation for a pay cut, the pay cut was reversed. Once in support of rural contractors who were on strike over a pay cut, that pay cut was reversed and once over a similar attempt at cutting pay and information on this one is spotty but it looked successful by second hand reports. Advantages: They were very successful, have existed for a very long time. Have managed to build power through multiple actions and were probably better at extending solidarity to CUPW than CUPW was to it. Disadvantages: Very informal, mostly seems to rely on leadership outside the job as well as inside. Also don’t have a clear process for settling smaller disputes. Really high turnover, they seem to make up for it with leadership from the cultural groups outside of work that make up the workforce. What happened? Still in existence. Up and down the West Coast are owner operators who work the large ports. They frequently take job actions, some actions scuttling thousands of trucks and tens of millions of dollars in merchandise. There’s a lot of variety between the different ports and some have taken lots of action, like LA or Vancouver. Advantages: Some coordination over a large geographic area, multiple ports, and two countries. Very strong economic leverage. Some coordination with other unions, (such as UNIFOR in Vancouver). Very stable and has been in existence for a very long time, probably decades. With job actions going back at least ten years. Disadvantages: Vancouver has multiple unions with UNIFOR representing one group of workers, some evidence this may be part of an effort to “tier” the workforce. Los Angeles has a lot of politics and a few different groups putting forward different strategies at different times. The usual lack of smaller scale models for addressing concerns of smaller groups of workers or issues that aren’t large enough for a wildcat to solve but may be too big for an individual worker to sort out themselves.